What can follow Relays week? How about HepsWeek? 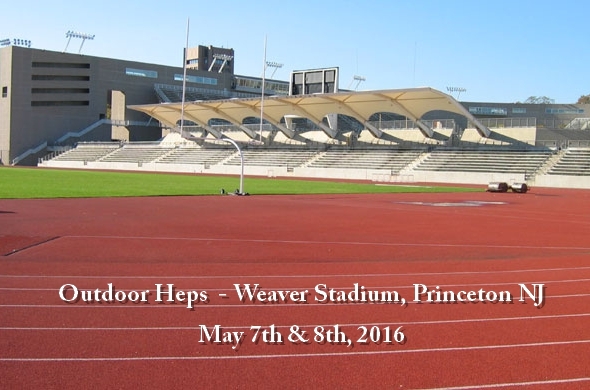 HepsNation returns to Weaver Stadium this weekend for the 2016 Outdoor Ivy League Heptagonal Championships – one of the fiercest and most exciting track & field meets on the East Coast (no bias… ok, slight bias). The Princeton men and Harvard women are looking to defend their conference titles, but we feel the rest of the conference will not make it that easy. We will start sharing our event previews later today and continue to publish them throughout the week, so keep coming back for updates. We have the championship schedule available online – it will be updated with the links to the live results pages before action begins on Saturday morning. Are you able to watch the meet in person? Great! Let the rest of HepsNation know by saying you’re “Going” on facebook – check out the event page here and start posting your “Good luck” messages or predictions on who will win what (but please keep sportsmanship in mind when you post). If you cannot make it to Princeton, don’t worry. Once again, Day 2 will be available through the Ivy League Digital Network starting at noon and lasting until the conclusion of the awards ceremony. For only $9.95, sign up for the single-day pass and you’ll be able to follow the action. We recommend packing an umbrella – the 10 day weather forecast is calling for scattered thunderstorms for Sunday. Temperatures should be pretty ideal for the competition – low 70s. So, who’s ready for HepsWeeks to begin? This entry was posted on Monday, May 2nd, 2016 at 3:00 pm. It is filed under Heps Champs, Spotlight. You can follow any responses to this entry through the RSS 2.0 feed.